Delphine, our specialist in culture and outstanding receptionist, introduces her creative crush: Erwin Redl, an “enlightened” Austrian artist who works with LED lights. Immersion in his first exhibition in Paris “Light matters” at the EDF Foundation. I find Paris amazing. It seems I can never get to know enough about it. This vibrant and continuously changing city keeps you walking around in its endless transformations. That city which adopted me 8 years ago has once again led me to a place I did not know. An original exhibition called Light Matters took me to the EDF Foundation, a former electrical substation that has hosted cultural events since 1990. That’s where I discovered the Austrian artist Erwin Redl. Once at the Foundation, I go through the main door and into the exhibition room. The two-floored art installation was created for the place. Ranges of suspended LED lights cover the entire room from floor to ceiling. I take a moment to find my way and identify that space filled with lights. Then I dare step into the “matrix”. First, a blue light. I am floating in outer space, time is suspended. Waves of light, I am in the ocean. The light changes. It sways and creates waves. It switches from blue to purple and red. The red is sharp and moves forward like a relentless wall. It covers the room scanning the space. The light runs over me. It runs over the people around me. We have become immaterial. Erwin Redl plays with light and the architecture of the rooms. 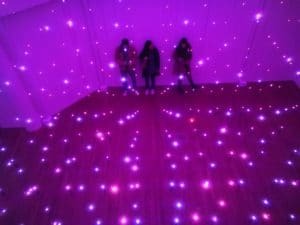 His art installations made of thousands of LED lights take us into another dimension…The exhibition room has become the artwork. We have become the artwork. What I like most about this artist is his ability to make you forget your own body putting it at the heart of his installation. The light, the place, the visitors are part of a whole. There are no boundaries anymore between the artwork and the one watching it. Erwin Redl likes to make his installations totally immersive. The boundary between what is real and what is virtual is erased. After studying electronic music, he moved to New York to study digital art. His art is highly praised in the US and has been displayed at the Madison Square Park and at the Whitney Biennial. His work questions the conception of artwork in the digital era and the place of human beings in art.